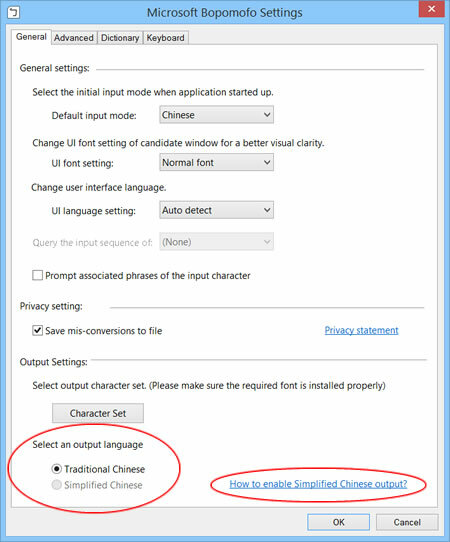 Q: When the Microsoft "New Phonetic" IME was updated and renamed to "Bopomofo" in the Windows 8.1 upgrade, it stopped supporting Simplified characters. And the "How to enable Simplfied Chinese output?" link takes me to an unrelated web page about Windows Privacy! How can I get this Traditional character IME to support Simplified Chinese? A: This is one of at least several Chinese features broken by the Windows 8.1 upgrade. I've found that reinstalling the Windows 8 PRC/Singapore IME, using a file that's been floating around China called "MSPY2012", will fix this problem for the Taiwan/HK/Macau IME and does not seem to affect anything else. The following files seem to work just fine, but please follow the instructions and set a System Restore point before installing. If compressed, extract Zip file by right-clicking and selecting "Extract all..."
Set a System Restore point before installing. Right-click on Install.cmd and select "Run as Administrator". OK? Feel free to contact me if this doesn't work or causes problems, or if you have other comments, questions or suggestions.